I have a mid-40s Dwarf Paladin over on the Moonrunner (US) server that dates from the pre-Real ID days. 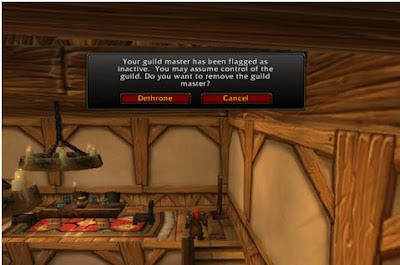 Back then, myself and a few other WoW bloggers created a social guild to connect in-game. As Real ID and cross server grouping has replaced the need to hook up on the same server, the guild has fallen into disuse. That said, every couple of weeks I login to Balthan to get in some low level BG action on a Ret Pally. Now, let's set something straight: I know that the GM isn't inactive; he's Rades of Orcish Army Knife. Considering that I know Rades hasn't exactly bolted for greener pastures, I got in touch with him about this little pop-up. Naturally, he thought it funny that it appeared, and he wanted to see what would happen if I tried to dethrone him. I wasn't so sure about how this would work out, since I was the only person from the guild to login for the past 4+ months, and if there were a vote, I wasn't sure how that'd work out with nobody else to cast a ballot. Hell, given the fact that we'd never identified which toon belonged to which blogger, I had no idea who was even still around to assist. Well, I need not have worried. I love how confrontational the popup box is! DETHRONE! Haha. All hail the new overlord of Puggers Anonymous!